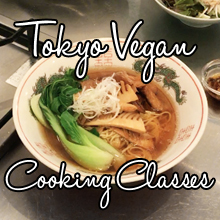 I love anything and everything noodles, from Japanese and Asian style noodles to pasta. Growing up in Japan, my mother only made tomato based sauces. I didn’t get to try pesto until my late teens with this horrible msg laden dried granule pesto in a shaker bottle. It was tasty in the way McDonalds used to be tasty for us at one point. Back then I didn’t know any better about all the toxins hidden in commercially processed foods. Once I tried real, fresh basil pesto, there was no turning back. 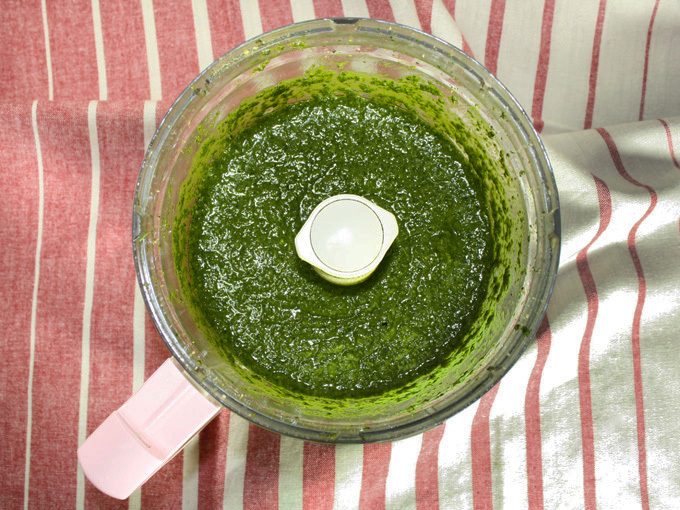 Pesto is so easy to make with a food processor, you’ll be done in less than 5 minutes. If you have access to fresh basil, you really should make your own. But it’s actually traditionally made with a mortar & pestle. And boy does it make a huge difference. Something about pounding and crushing the garlic, pine nuts, and basil brings out vibrant flavors and aroma, compared to chopping them up in a food processor. It require some elbow grease and time, but it’s definitely worth trying at least once. It makes a world of difference. However, there’s nothing wrong with making pesto with the food processor. After all, who doesn’t want their pesto done within minutes? Just add the garlic, pine nuts, nutritional yeast (in place of the traditional ingredient, Parmesan cheese), basil leaves and salt into the food processor and run it until chopped fine. Stop the food processor a few times and scrape down the sides. Keep the food processor running and pour in the olive oil and run it until it becomes a nice smooth pesto. Done! This make about a little less than 1 cup of pesto. So depending on how much noodles you are serving, you are going to have left over pesto. To store the rest, you can either refrigerate or freeze it. If you refrigerate, it’ll keep for 1 week, and if you freeze it, it’ll last for 3-4 month. I like having pesto on hand in the freezer so I can enjoy it anytime. To keep in the refrigerator, put the pesto in an airtight container like a glass jar, and pour in some olive oil until the pesto is completely submerged under the oil. This will prevent the pesto from turning color and going bad. To keep in the freezer, put the pesto into an ice cube tray. Pour in the olive oil until the pesto is submerged under the olive oil, and put it in the freezer. Once the pesto is frozen, put the pesto cubes into a Ziploc bag and back in the freezer. Now onto the zucchini pasta, or “zoodles.” There’s 2 ways to make this, one is using a spiralizer, and the other is using a mandoline slicer. For making raw veggie spaghetti noodles, a spiralizer is important equipment to have. I use this one and it works great. Super easy to use, and you can get your zoodles done in no time. Its only draw back is it takes up a bit of room. There is a new pro version option from the same company that is a little pricier. I’m kicking myself because I wish I had it, simply because it folds up and becomes more compact, and is much easier to store. I might have to get this one at some point. 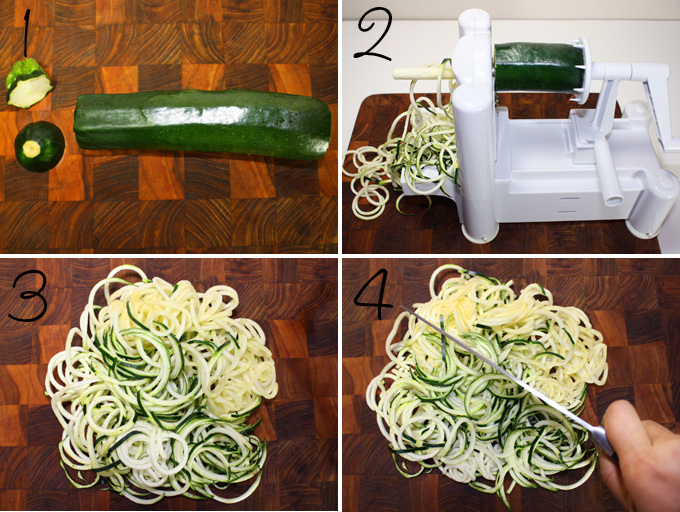 To use this spiralizer to make zucchini pasta, fit your 1/8 inch spacing blade. Top and tail the zucchini, and place it onto the spiralizer and turn the handle away. It’ll start dispensing the zoodles. 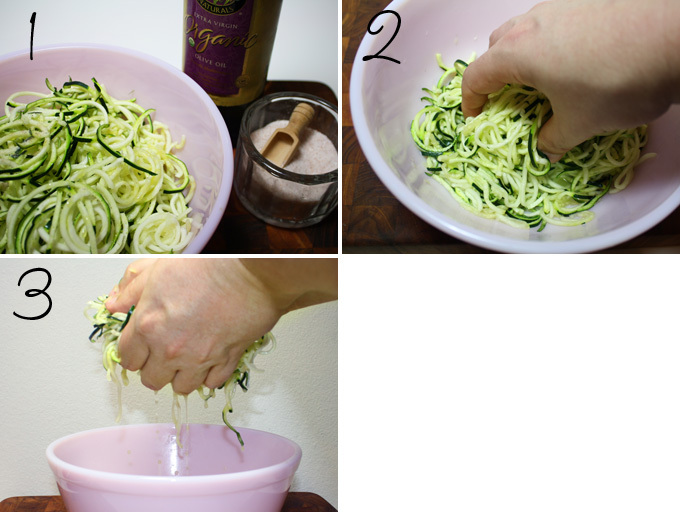 Once you’re done, chop it a few times with a knife so that the zoodles aren’t too long, and easier to eat. It is best to clean the spiralizer’s blades off as soon as you’re done for easiest clean up. Now for the mandoline slicer. Top and tail the zucchini, and slice the zucchini length wise. Watch your fingers and used the protective guard. Stack the slices and cut them into fettuccine size noodles with a knife. Once you have your zucchini noodles ready using either method, transfer the noodles into a bowl and lightly drizzle some olive oil and a pinch of salt. Massage the zucchini pasta until it softens and set it aside until it releases water for about 2-3 minutes. Right before serving, ring the noodles out well. Once you toss it with pesto, it starts to slowly release more water from the salt in pesto, so it’s important to ring out the noodles well. Toss the zucchini pasta with some pesto. 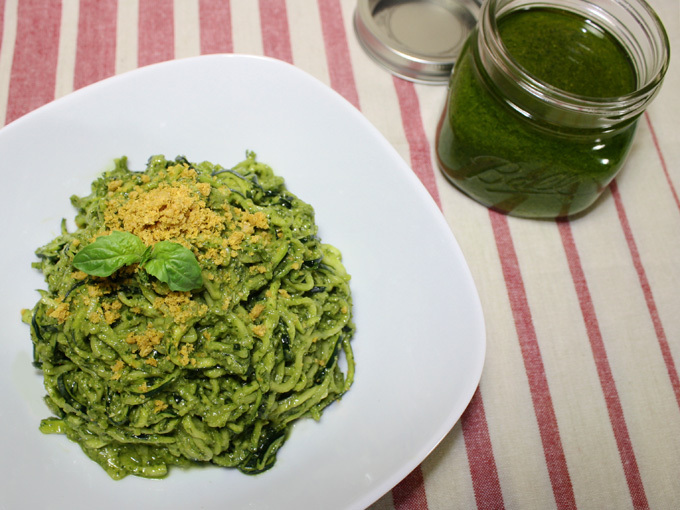 Sprinkle some raw vegan Parmesan cheese, or if you don’t have time to make it, just nutritional yeast, and garnish with a basil leaf. Okay, just looking at this picture makes me hungry. I’m gonna go make some more for myself. Enjoy! Add all the ingredients except the olive oil into the food processor, and run it until chopped fine. Stop the food processor a few times and scrape down the sides. With the food processor running, pour in the olive oil and run it until it becomes a nice smooth pesto. Fit your ⅛ inch spacing blade. Top and tail the zucchini, and place it onto the spiralizer and turn the handle to make the noodles. Chop it a few times so that the noodles aren't too long, and easier to eat. Transfer the noodles into a bowl and lightly drizzle some olive oil and a pinch of salt. Massage the zucchini pasta until it soften and set it aside until it releases water for about 2-3 minutes. Right before serving, ring the noodles out well. Top and tail the zucchini, and slice the zucchini length wise. Stack the slices and cut them into fettuccine size noodles. Transfer the noodles into a bowl and lightly drizzle some olive oil and a pinch of salt. Massage the zucchini pasta until it softens and set it aside until it releases water for about 2-3 minutes. Toss the zucchini noodles with about 4 tablespoons of pesto. Adjust the amount of pesto you add to taste. 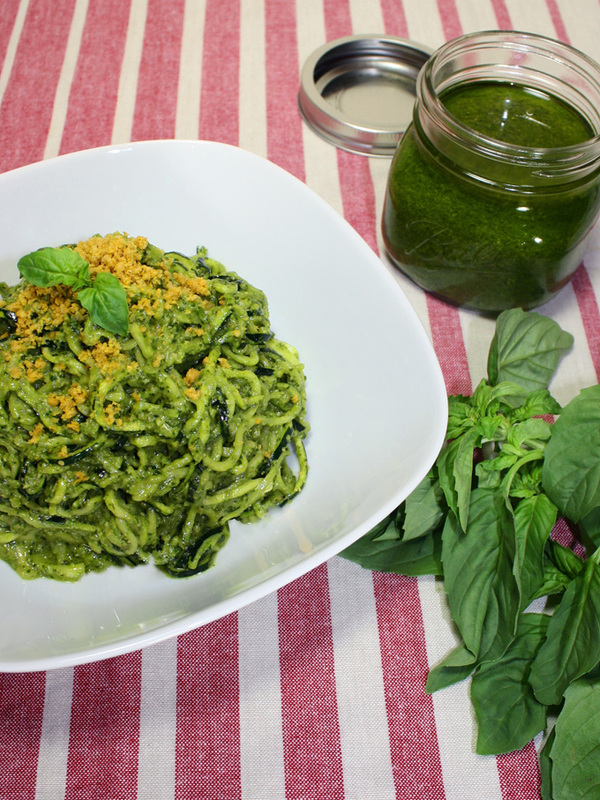 Sprinkle some raw vegan Parmesan cheese, or if you don't have time to make it, just nutritional yeast, and garnish with a basil leaf. Add the pine nuts into the food processor and pulse until it becomes Parmesan like granules. Put in the nutritional yeast and salt, and pulse several times to incorporate. Do not over process as the pine nuts will release too much oil. Store in an airtight container and keep in the refrigerator or freezer. Keeps for 1 month. 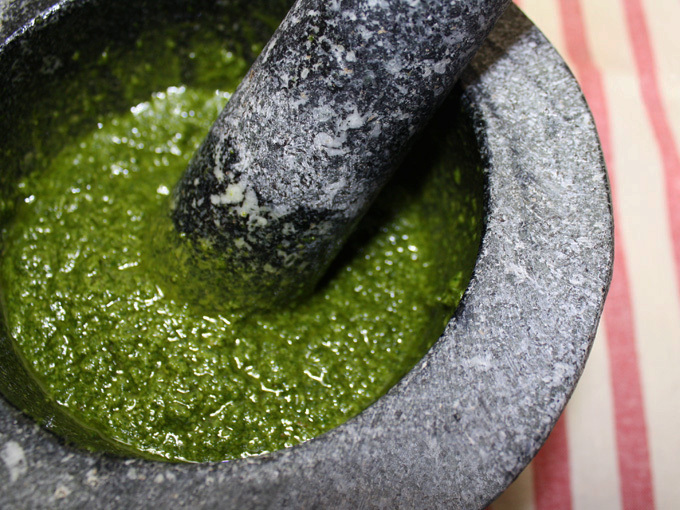 Basil pesto is traditionally made with a mortar & pestle. If you are going to try the mortar & pestle way, start with garlic, salt, nutritional yeast, then pine nuts, and add the basil leaves in several parts. Then finish it off by adding the olive oil in. Nutritional yeast is not the same with baking yeast. Do not substitute with baking yeast! Your pesto will be ruined. Once you toss the zucchini pasta with pesto, it starts to slowly release more water from the salt in the pesto, so it's important to ring out the noodles well right before you toss it with sauce. Basil pesto tossed with zucchini pasta will keep for 2 day in the refrigerator but it does start releasing water, so I recommend not keeping it for too long. You can either refrigerate or freeze pesto. If you refrigerate, it'll keep for 1 week, and if you freeze it, it'll last for 3-4 month. To keep in the refrigerator, put the pesto in an airtight container like a glass jar, and pour in some olive oil until the pesto is completely submerged under the olive oil. This will prevent the pesto from turning color and going bad. To keep in the freezer, put the pesto into the ice cube tray. Pour in the olive oil until the pesto is submerged under the olive oil, and put it in the freezer. Once the pesto is frozen, put the pesto cubes into a ziplock bag and store it in the freezer.